It is with great excitement that Projects Abroad has partnered with Animal Defenders International (ADI) to rehome several animals rescued from a lifetime of abuse at the circus. ADI is an animal rights charity that has been working to protect animals around the world through education, legislation and rescue operations since 1990. They have exposed and stopped animal cruelty in many circuses throughout Peru, and rescued many animals from awful living conditions. Our partnership with ADI comes after discussions surrounding the future of some of their most recently rescued animals, including two rare spectacled bears and a mountain lion. In 2004, Projects Abroad established the Animal Rescue Centre at Taricaya Ecological Reserve; it has since been recognised by the Peruvian government as the best and most effective of its kind in the country. With this in mind, ADI approached us to embark on an exciting project with them to relocate the rescued animals to Taricaya. Taricaya is a 476 hectare nature reserve in the heart of the Amazon Rainforest. The reserve is home to one of the most diverse ecosystems in the world and hosts thousands of species, including the newly discovered stripe-backed bittern. Having seen our spacious enclosures and the health of our residents at Taricaya, ADI President, Tim Phillips, and Vice President, Jan Creamer, were certain that Taricaya was the perfect new home for their rescued animals. With their relocation to Taricaya, we will gain custody of the two bears and the mountain lion. 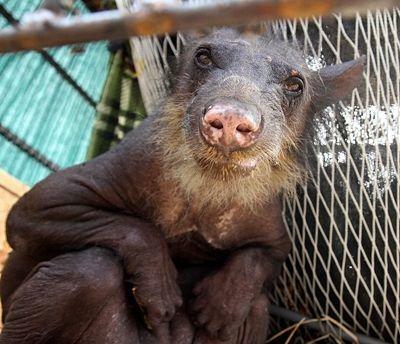 The first bear to be relocated, Cholita, is an elderly female that was kept illegally by a circus. Cholita’s physical state is evidence of her abusive past; her fingers were brutally cut down in order to declaw her and her teeth broken, leaving her defenceless. Cholita also suffers from severe hair loss due to stress; where healthy spectacled bears have thick, black fur, Cholita is almost entirely bald. Animal Defenders International rescued Cholita the spectacled bear from a life of abuse at a circus in Peru, where she was declawed, had her teeth broken and lost her fur due to stress. Mufasa, the rescued mountain lion, has been in ADI’s care since April this year, when he was rescued during a surprise circus raid. Mufasa, now an elderly cat, was likely taken as a cub and forced to spend his whole life in the circus. 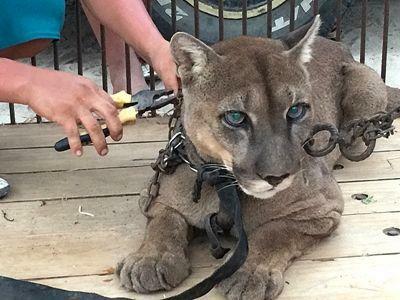 ADI found him chained in the back of a pick-up truck, next to old circus equipment and with only metal beneath his paws. Since their rescue, Cholita and Mufasa have been living at the ADI Spirit of Freedom rescue centre, where they are receiving 24-hour care and being monitored closely. Together with ADI, Projects Abroad Peru staff and volunteers have begun construction of the animals’ new homes at Taricaya, which will provide them with a jungle habitat very similar to that of their counterparts in the wild. As soon as construction is complete, the animals can begin their new life at Taricaya. In addition to Cholita and Mufasa, we will also initially be accepting a rare military macaw, two brown woolly monkeys and two Peruvian spider monkeys; the last two will be joining our release project. We will receive the second spectacled bear, Dominga, in November. This new partnership is a great honour for Projects Abroad and we are thrilled at the chance to provide a home and safe haven for these rescued animals, so that they may live out the rest of their days free from abuse. We look forward to the new opportunities that our partnership with ADI will bring and we are grateful to be able to play a role in the protection of vulnerable animals. ADI is collecting donations for materials to be used in Cholita and Mufasa’s new homes at Taricaya. Send your support today.